The advantages of using biometric locks compared to a regular key are endless. Residents and Businesses in Maryland and DC no longer have to worry about forgetting their keys, and security concerns are becoming a thing of the past. Thanks to local locksmith company, King Door And Lock, the once futuristic technology of biometric locks is now available to everyone. The advantages of using biometric locks are endless. To start with, they are easy to use and can be combined with just about any type of door, meaning you do not need to break the bank. Additionally, there are a large array of electronic locks to choose from. You can decide to use fingerprint, a palm, or retina scan when you install your system. Whether you have a small family that you want to keep safe at home, or you need to grant access to a large number of employees at your place of business, more and more security experts are now recommending biometric lock systems. Many potential customers worry that this new system will be difficult to use. Thankfully, there is no need for concern because biometric locks can be easily programmed and can hold information for up to 50 users. These futuristic lock systems may be easy to use, but not every locksmith company has the necessary equipment or the skilled technicians that are able to properly install or repair biometric locks. 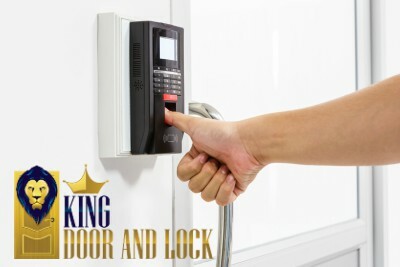 Thankfully, residents and businesses in Maryland and DC areas are able to rely on the expertise and convenient service of King Door And Lock to welcome them to the future.